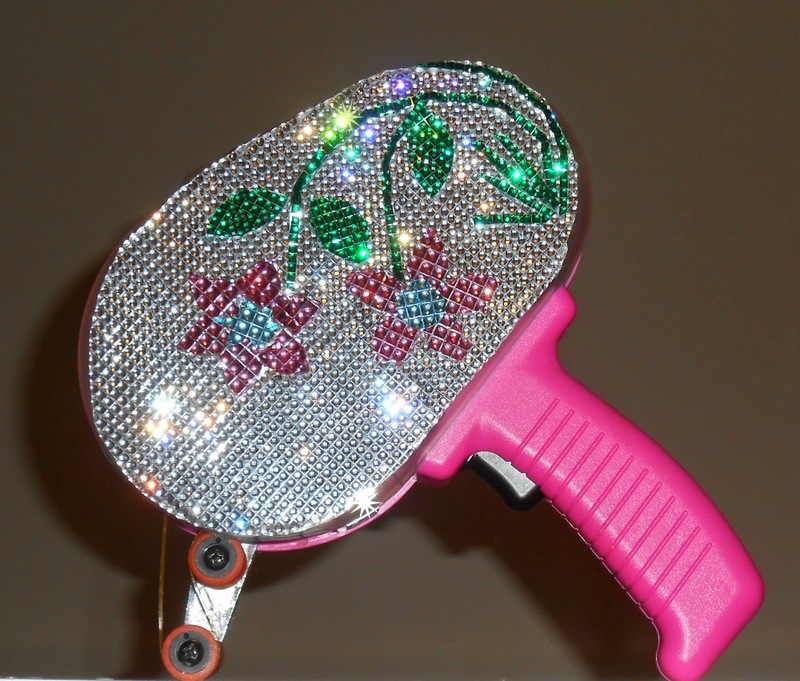 CardMonkey's Paper Jungle: TBB Friday: Bling out your GUN! Happy Beautiful Friday, Friends and Followers! It's that time again for The Buckle Boutique Friday, when I post some of the blingy-est of wonderful projects made possible using the fab supplies of The Buckle Boutique (TBB). Here is a nifty way to make YOUR Adhesive Tape Gun (ATG) stand out in a crowd, especially when you take it to a crop and it seems like everyone has an ATG. Bling it out! To make this project, I used TBB's versatile "Dazzling Diamonds" rhinestone resin sticker sheets. The best way to make a neat version of this would be to use flower dies to cut the flower and the background space, using your Big Shot, Cuttlebug or any other cut/emboss tool. My machines were on the fritz when I cut this, so I did it by hand, with an X-Acto knife. The resin cuts like butter. Then, just assemble your design, peel off the adhesive backing on the rhinestone resin sheets. Want to win a kit to make your own blinged out ATG? Comment on this post and refer a friend to do the same, and your name/e-address will be entered into a drawing to be held in June when I celebrate my 4th YEAR BLOGAVERSARY with a "PAY IT FOUR-WARD! PRIZE". This prize includes the brand new, in package ATG by 3-M, and a sampler pack of Rhinestone Resin Sticker Sheets to design your own cover. To be eligible to win, your comment MUST include your name, your e-mail address, the name of the friend you've referred, and the words "BLING MY ATG". All comments must be received by June 30, 2014 in order to be eligible to win. No purchase required; restrictions apply. FYI: I have the privilege of serving on The Buckle Boutique's Design Team. You can see creations I've made for The Buckle Boutique posted here on my blog, and on TBB's social media sites, on the 2nd and 4th Friday of every month. to make! I like it. Cool-ee-oh! I would love to win a new ATG and then to bling it out, would be an awesome reminder of you! Thanks for the chance lovey!! The name of my friend that I shared for your pay it forward blog anniversary is Kathy Palmer.